Bruce Anderson scores to make it 1-0 Dunfermline. 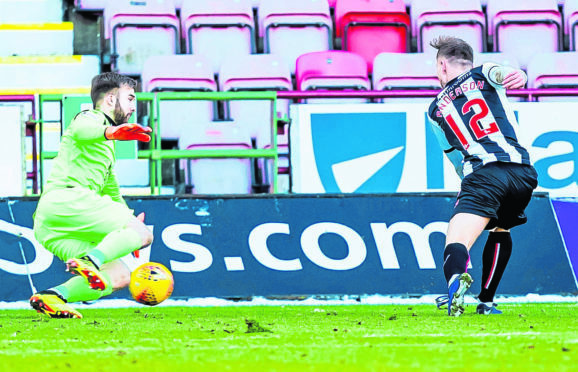 Anderson joined the Pars on a deal until the end of the season on transfer deadline day, and the 20-year-old netted on his debut in Saturday’s 2-1 defeat to Ross County. The Banff-born forward is optimistic he can thrive for Stevie Crawford’s men after ending the Fifers’ three-match goal drought. He said: “I’m quite a confident character, I’m always confident that whenever I play I’m going to score. That’s just my mindset. “I’m happy to take the responsibility of scoring the goals here. It’s something that I can hopefully thrive on. I quite like the pressure of it. “I just want to get as many as I can – I’m obsessed with scoring goals. I’m desperate to do well here. Anderson feared his season was over after suffering a shoulder injury in the Dons’ 2-1 victory over Livingston on December 29 but after recovering quicker than expected he feels he needs to regain match sharpness before the Dunfermline supporters will see his best. Anderson, who had a previous loan spell with Elgin City, said: “I feel quite lucky because I was told my season was over but I have somehow managed to get myself back fit. “My shoulder came out of place but went straight back in so that has actually helped me. I went for a scan and all came back good. “I’ve been working on strength and it has helped it. Anderson netted twice in 17 appearances for Derek McInnes’ side this term, although he was mainly restricted to substitute outings, and he is desperate to grasp the opportunity to gain more regular game time with the Pars, who are seventh in the Championship. He added: “It has been a bit of madness this year, especially after scoring in the Rangers game. “I want to be playing, that’s the main thing for me. I’m hungry to do well, so I’m delighted to come here and I’m sure it’s good for all parties. “I heard about Dunfermline a couple of weeks ago, and nothing was official but as soon as I heard about it I always had my mindset I wanted to come. “I had a conversation with the manager here and I wanted to come here as soon as I spoke to him.